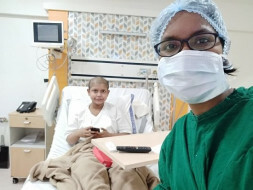 Help my little sister Madhurima fight relapsed cancer! We are two sisters, Madhurima and Hriturima, who live in the small town of Udaipur in Gomati district of Tripura. My father, Khokan Baidya, used to run a small shop selling small kitchen appliances and mobile recharge, earning Rs 7,000 ($108) a month. In August 2016, my little sister of 11 years started having breathing problems, vomiting and weakness. She was in class 6 and I was in class 10 on scholarship support in Brilliant Stars School. After some checkups the local doctor raised suspicion of cancer and asked us to go to a bigger hospital immediately for more diagnosis. My mother, Ratna Datta, immediately went to Tata Memorial Hospital (TMH), Mumbai. My father had to stay back with me as I had Board exams that year and our small shop was our only source of income. After initial tests at TMH, we were devastated to hear the news that my sister had 3rd stage of Primary Mediastinal B-Cell Non-Hodgkin’s Lymphoma! It is a type of blood cancer that starts in white blood cells, grows fast and symptoms are not visible in initial stages. It mainly affects adults, but my sister was so unfortunate to have it as a child! The lymphoma was large in size in the chest (14 x 5 cm) and was causing breathlessness. Due to the urgency of the situation she was admitted to private ward initially which was very expensive. My mother does not speak Hindi well and was very stressed in this situation because she was alone. 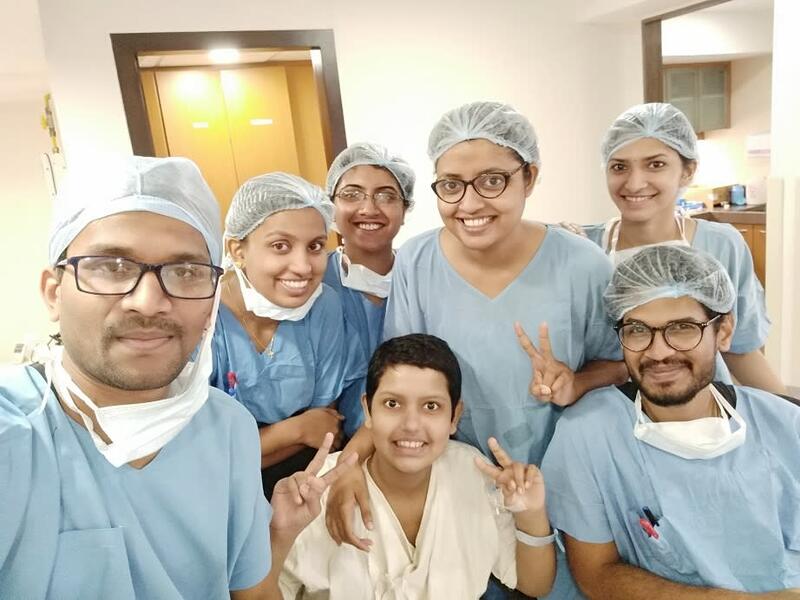 In the first phase of treatment at TMH, Madhurima received 6 cycles of chemotherapy during 7 months (she also had chickenpox which delayed the treatment). It was a very hard time for us, especially my mother who was all alone in Mumbai and no idea what to do. She would cry every day on the phone. My sister was disturbed by this and would blame herself for this; she felt that she will no longer be able to go to school and fulfill her dreams. 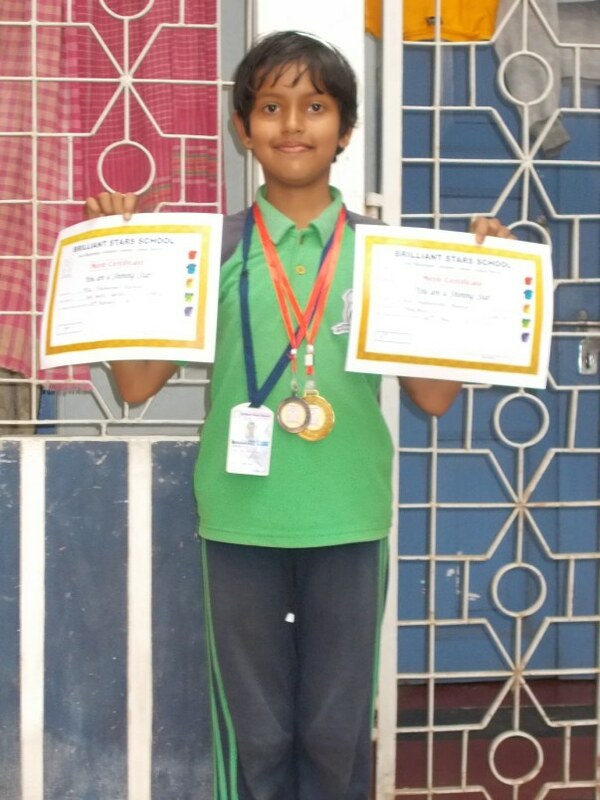 She is a very bright student and has won many awards in academics and extra-curricular activities. After chemotherapy, she had PET scan and cleared it. She was then given radiation for next 25 days and cleared to go back to Tripura. We were so happy to be together again and see her healthier! However, there were lots of personal expenses that happened during this treatment. Fortunately, my mother and sister were given shelter by St. Jude’s Home which gave free accommodation and basic ration for cooking which saved some money. But fruits, vegetables, travel by taxi to avoid infection and buying medicines spent a lot of money. And since Tripura is far away from Mumbai, my mother and sister had to take flights at short notice which further increased the expenses. Our small savings were badly exhausted and we had to ask money from people which was embarrassing. My sister needed special diet, medicines and tests which increased our monthly expenses. So my uncle told my mother that he will take care of my expenses from now on so that my family doesn’t have too much financial burden and can focus on my sister’s treatment. My mother was especially very exhausted and broken fighting alone in Mumbai. My father took a small business loan to keep the shop running. Madhurima started going to school again and was so happy with her friends and teachers! My sister had to return to Mumbai after 3 months. But this time my father had to accompany my mother as she could no longer handle things alone. 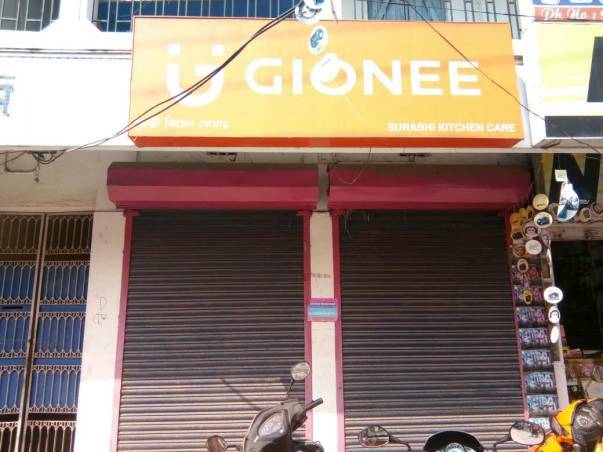 He had to shut down the shop and now there is no means of earning for our family. There is also no way to pay back the installments of the loan he has taken. But we did not know that worse was yet to come. After checkup at TMH, PET scan showed that her cancer had relapsed! We were completely broken. There were 3 initial cycles of chemotherapy which did not respond well and the malignancy spread further. The doctors advised immediate bone marrow transplant (BMT) after another 2 higher dose of GDP chemotherapy to control growth of bad tissue. This took about 7 months. I was brought to Mumbai to do tests so that it can be checked if I can be the donor for BMT of my sister. Fortunately there was 100% match! 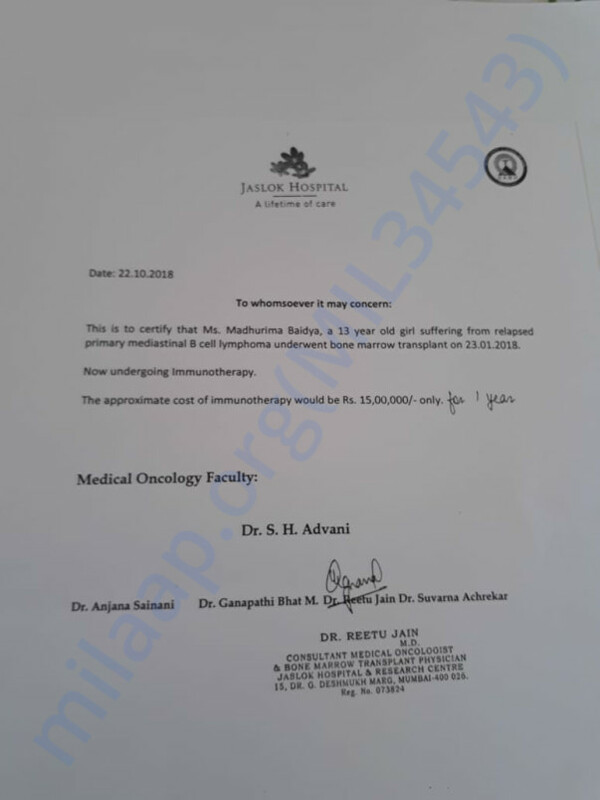 After PET scan was cleared, doctors told us that Madhurima will have to be immediately transferred to Jaslok Hospital for BMT within 21 days of last GDP chemo because the waiting period for BMT in TMH was 1 year! This was bad news for us as this hospital was in a different location and far away from St. Jude’s Home where my parents and sister were staying. They had to leave that place and take up a room near Jaslok hospital which was expensive along with other daily expenses. We then came to know that the cost of entire BMT treatment (actual transplant and follow up procedures) will be Rs 20 lakh ($30820)! We had no idea from where we will get this money! Within 10 days my parents had to visit multiple trusts to arrange some initial money. Fortunately a few Trusts gave us some money to start the treatment. The transplant was done successfully on 22 January 2018. 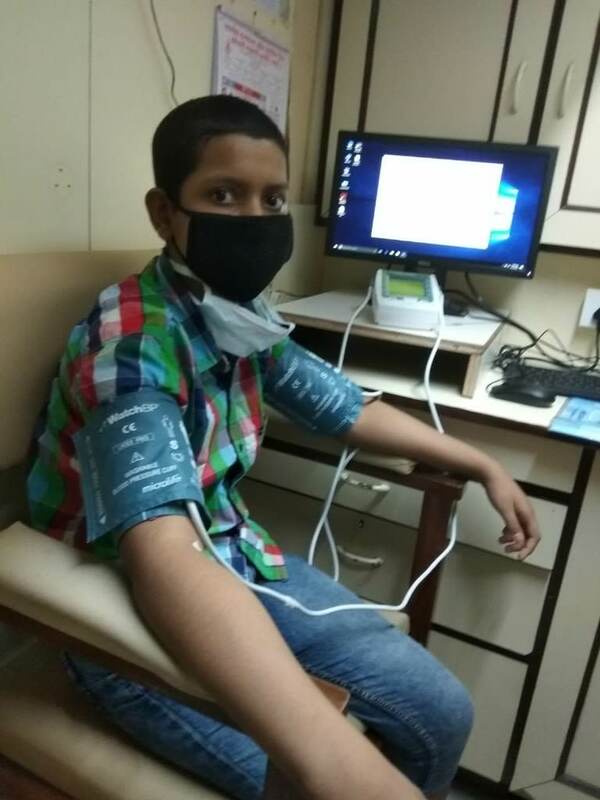 However Madhurima fell ill after a few days and had to be immediately admitted to the hospital again for 8.5 days which further increased the expenses. She has now been discharged for remaining treatment and stays with my parents in their small rented room. 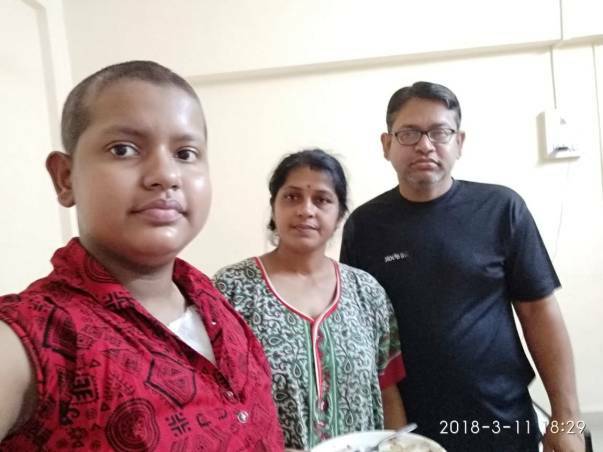 My parents and sister have now been staying in Mumbai for about 9 months for second phase of treatment. They have to go to hospital every week for 2-3 days for taking many tests and medicines. 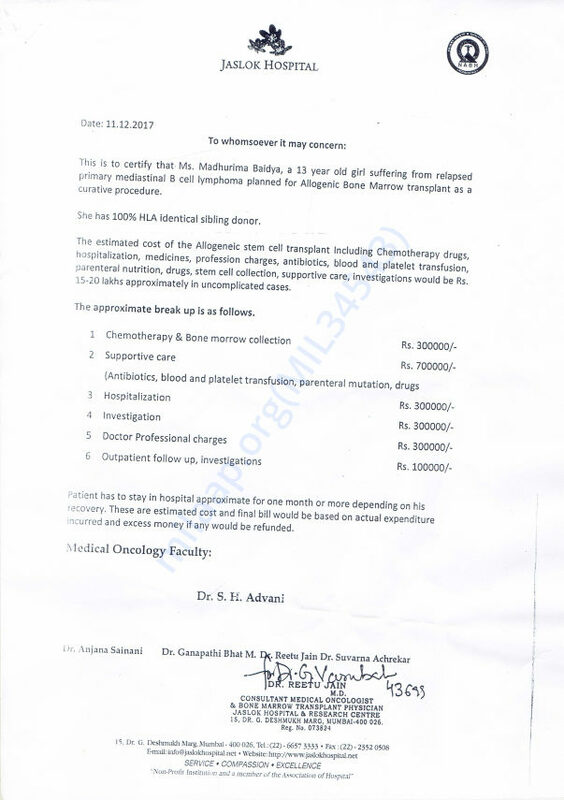 Out of the Rs 20 lakh ($30820) expense of total BMT treatment, till now there has been an expense of Rs 9,08,105 ($13994). We have tried everywhere and some money was donated by Trusts to meet expense only till Rs 10,76,964 ($16596). 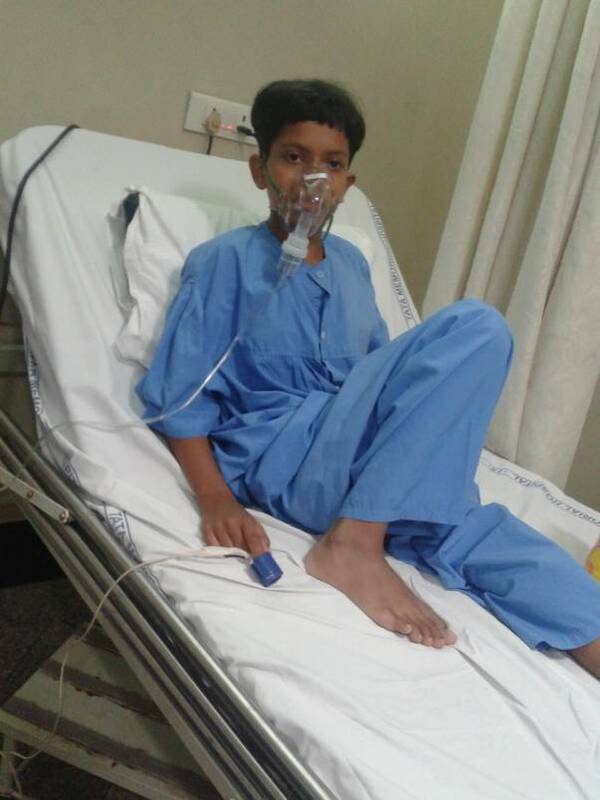 We are now in urgent need of the remaining Rs 9,23,036 ($14224) to complete the remaining treatment. Our little savings have almost finished in meeting the everyday expenses since treatment first started at TMH in 2016. We have been fighting against all odds for almost 2 years and are already in huge debt to bank and many individuals from whom we have borrowed money. We are trying hard to keep our hopes alive and also keep Madhurima hopeful about her future. She wants to go back to school, be with her friends and study further to fulfill her dreams. I want to see her happy and healthy and be with her again. Half of the treatment is complete and we desperately need your help in completing the remaining treatment. Please help my sister defeat cancer and complete her Bone Marrow Transplant treatment! A big thank you to all of you for the immense support! 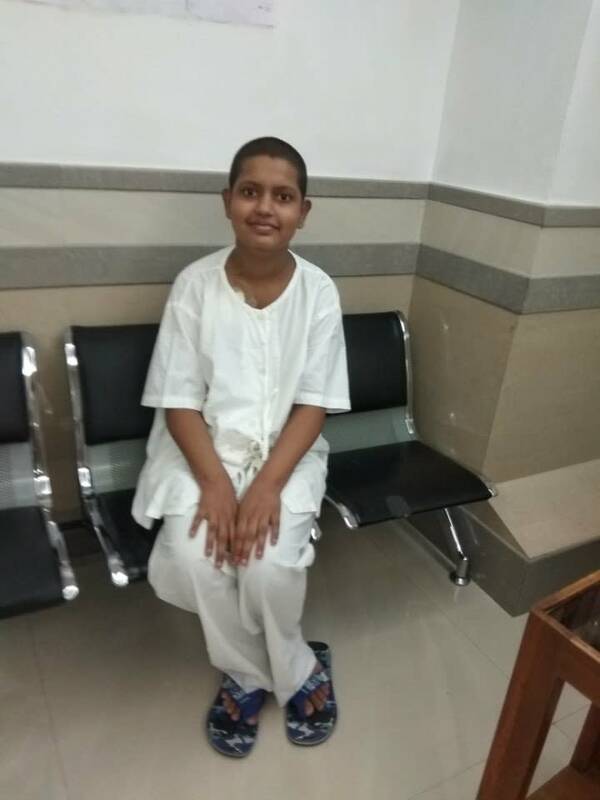 Madhurima is presently at home and undergoing Immunotherapy twice a month. Her reports are also good. She had undergone her Bone Marrow Transplant successfully with her sister as the donor. Please pray for her health and share the campaign. 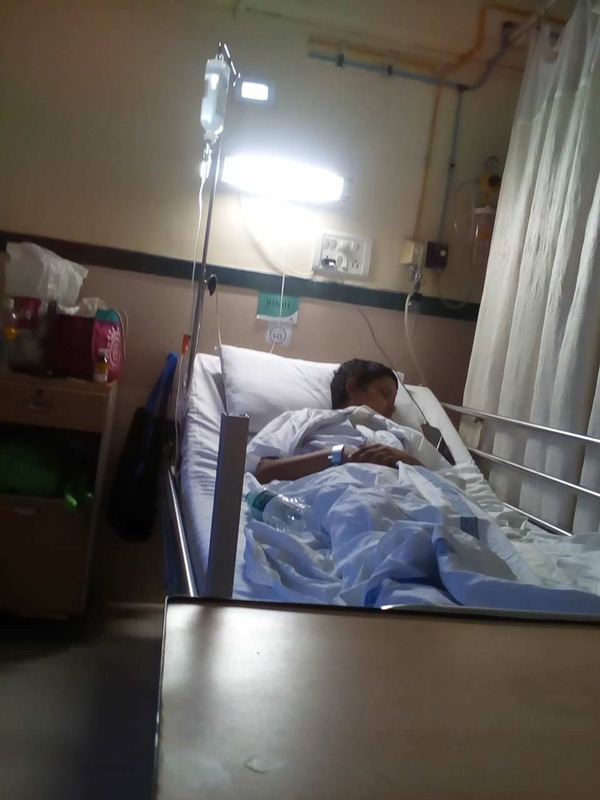 I am happy to share Madhurima's health update with you. She has been recovering steadily as before and receiving her weekly tests and medicines. Her parents and sister are still in Mumbai. Her sister's cells had been preserved by the hospital when she had gone to Mumbai as a bone marrow transplant donor. Now doctors have started Donor Leukocyte Infusion (DLI) treatment. Madhurima is receiving those cells along with rituximab medicine. She was admitted in hospital on 30 and 31 July and was given some injections. In DLI the patient receives a boost of immune cells from the original donor's blood as a strategy to manage cancer relapse. After this first treatment, doctors will see its response and will plan further accordingly. She will undergo more such DLI procedures in future. Below are some pictures. I thank you on behalf of Madhurima and my family for your kind help. 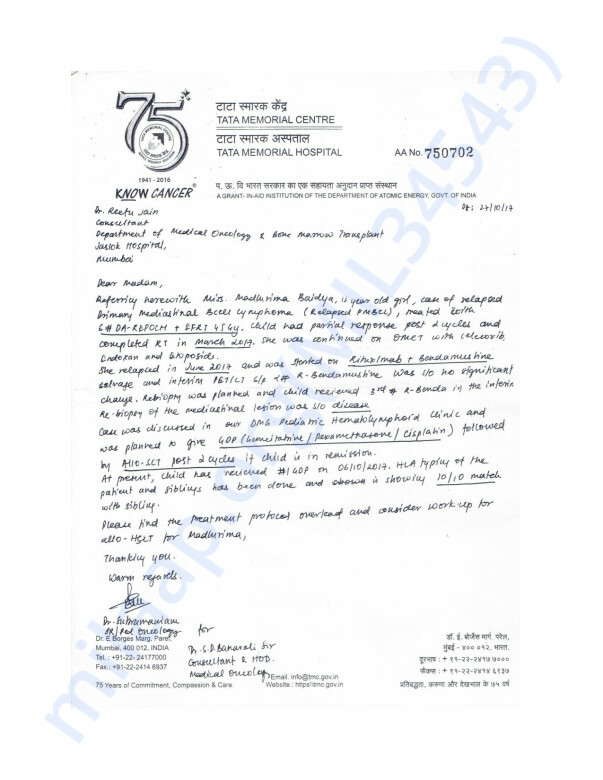 Dear friends.I am happy to share Madhurima's progress report. 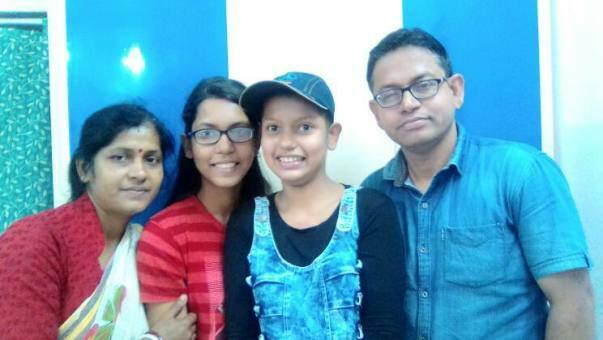 After her bone marrow transplant one PET scan has been done to check if there are any tumor cells or malignant cells. Her biopsy report shows no malignancy which means that there no disease in the tissue. This is happy news for us! Further evaluation has been advised by the doctor and there will be more PET scans ahead. Her blood test reports are also consistently good and her haemoglobin has increased to 13.3. We are hoping that this will continue and she will gain more strength. Thank you for your support and kindness. Please spread the word further to help us continue her treatment.